WASHINGTON, Oct. 23 (Yonhap) — The United States will decide whether to inspect the demolition of a North Korean nuclear test site and declare an end to the Korean War in the course of negotiations with the North, a senior South Korean official said Tuesday. 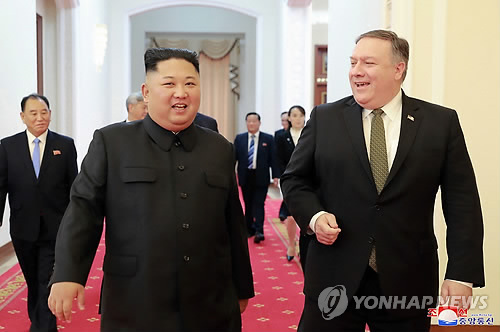 North Korean leader Kim Jong-un told U.S. Secretary of State Mike Pompeo earlier this month that he will allow inspectors to visit the test site in Punggye-ri to confirm that it was “irreversibly” dismantled in May. The North has also sought to declare an end to the Korean War, which closed in 1953 in an armistice with the U.S.-led United Nations Command, to ease tensions ahead of its stated plan to denuclearize. Kim and Pompeo agreed to launch working-level negotiations led by North Korean Vice Foreign Minister Choe Son-hui and U.S. Special Representative for North Korea Stephen Biegun. But the talks have yet to begin, with no announcement on a date and location. Meanwhile, Pompeo has said he hopes to meet with his North Korean counterpart next week to continue discussions on a potential second summit between U.S. President Donald Trump and Kim. The date and venue of that meeting are also undecided, the South Korean official said. Pompeo did not specify who his counterpart would be, but the official was skeptical that it could be the North Korean leader’s sister, Yo-jong, who has been seen in most important meetings involving her brother. He also backed recent reports that the second Trump-Kim summit is likely to be held early next year. The first summit in Singapore in June produced a statement committing the North to work toward “complete” denuclearization of the Korean Peninsula in exchange for security guarantees from the U.S.